The Modernist Market of Totana, which was suspended at the end of November due to the rainy season, will be held on the weekend of February 8 to 19, in the squares of the Constitution and Old Balsa. This activity was part of the program of commemorative events promoted by the Department of Culture to celebrate the Centennial of the City 1918-2018, which closed last December. This activity will open on Friday the 8th, starting at 7:00 p.m., and will last throughout the weekend set in the modernist period of the late nineteenth and early twentieth centuries. 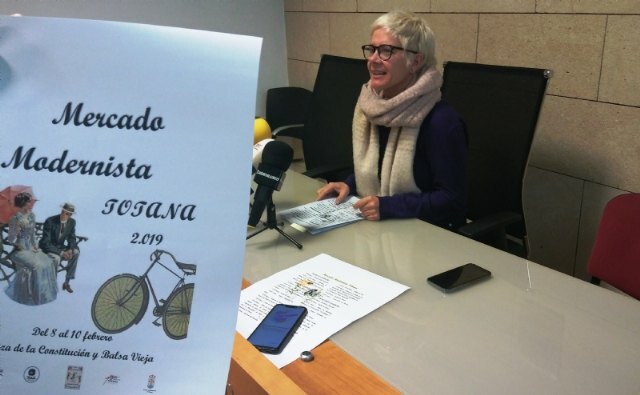 The Councilor for Culture, Eulalia Moreno, has presented this event that brings together numerous activities throughout the weekend, and which will be added the Concentration Vespa Totale Club on Saturday 9 in the morning. The Modernist Market will take place in the two aforementioned squares of the urban center of Totana and will have a wide range and offer of activities and characters of the period, which will be reinforced with the presence of representatives of the Cultural Association "Los Modernistas" of Cartagena. Among the activities include puppet theater, children's games of the time, tasting typical dishes in modernist tavern that will manage the Brotherhood of Jesus and The Samaritan, workshops, dance performances, exhibition of tools and old photographs of Totana, old bicycle route , among other. The councilor invited the public to participate in this activity that had to be suspended in its day due to inclement weather and encouraged neighbors to meet during this weekend in the city center to enjoy this .